The Wards of Derbyshire are a prolific family, so finding the right ones is not easy. 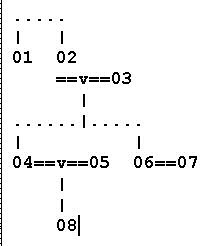 Two family trees are found in Ince's Pedigrees, which I reproduce below. There is also a pedigree of the Ward's intermarriage with the Bradley family which is found in the Strutt Archives (Record Office). I am also going to append here my own document showing the intermarriages between the STRUTT and the WARD families. These are important, since they provide reasons for Jedediah Strutt to have come to Belper - although there were many factors in his decision other than family connections. Memorial Windows of St Wulfram's, Grantham Lincs with window honouring Elizabeth Bradley, wife of Richard Ward. (**) Richard Ward is the brother of John Ward of Belper, and is mentioned elsewhere on this website. His sister Elizabeth Ward married a John STRUTT "of Newton", in 1769. This would account for the John Strutt found in Belper at that time, working closely with the Strutt mills and also with Ward, Brettle and Ward. 03 Salathiel WARD only son & heir. He his father & mother in 1818. This tree below is the INCE version of the one at the top, which was given by the Bradley Family to the Strutts. It appears that Ince himself drew from the same material - but there is additional information. 05 Charles 2nd son bap at Duffield 16 Apr 1681 burd at Wirksworth 1699 s.p. [note nearby:] Tennants for life under Matthews Will. 16 Charles eldest son bn 1702 & died 1717 unmarried s.p. 20 Martha bap 1710 mard 1738 to Henry TAYLOR at Wirksworth burd 1739 at Duffield s.p. mard 26 Dec 1763 to Richard WARD of Belper. Lessor of Plaintiff. 26 (B) Benjamin bap Married 1734 burd Dec 1737. Devisee in fee. 27 Henry BRADLEY died s.p. 34 Thomas eldest son Bap 1743 died 1747 s.p. 35 John bap 23 Jun 1745 & burd 20 Jan 1765 s.p. 36 Mary bap 2 Sep 1749 burd 5 Apr 1771 s.p. 18 .... wife John MONKS of Belper Gent. He died 7 Sep 1824 & the 1st Corpse? 34 William of Birmingham printer bn & bap 28 Feb 1802 died 11 Jan 1847 s.p. Here is a reconstruction using known records from Ince's Pedigrees as above and Parish Records showing that Jedidiah Strutt could very well have been first cousin to John Ward the hosier of Belper. Please click the thumbnail to see the image in full.